Baylee Tobin’s wedding was set for March 24. It was going to be a perfect spring day full of sunshine and blooming flowers. The photographer made plans to take the wedding photos at a local barn, giving the pictures a colorful pop of nature. The wedding was just two days away and everything had fallen into place. The bride’s best friend flew in from Hawaii, the wedding planner had already completed the last-minute touches and Baylee was ready to marry the love of her life. Then she turned on the news and found out that on the day of her spring wedding, Indiana was expecting a snowstorm. For those of you who aren’t Hoosiers, it is important to note that Indiana’s weather is always unpredictable. Baylee took this into account and assumed that it wouldn’t actually snow. The big day arrived and although Baylee remained hopeful, snow started falling early that morning and continued all day. This was not how it was planned, but instead of letting it tear her down, Baylee stayed positive. “Once it’s your wedding day you cannot change anything, we did not have a choice, so we decided to embrace it’” said Baylee. Her biggest piece of advice for any bride is to get a wedding planner. Baylee's planner, Hannah Strickler from Design the Day, helped to calm her nerves and cared about the little things. “I called her one night crying because I did not know what color to pick out for my linens...she was so helpful,” said Baylee. Of course, some of the plans for the day had to change. Instead of taking photos at a barn, they decided to take them at their venue, Biltwell Event Center. They also had to push the ceremony 30 minutes back, considering the interstates were closing due to weather. Baylee thinks that all brides should get to know their vendors well. Since Baylee developed such a good relationship with all her vendors, the alterations to her big day were easily made. She is grateful for Hayley Reed and Lauren Allen, who helped with last-minute changes. Of course, the snow caused some logistical issues as well. It made it harder for guests to get to the wedding, but Baylee was okay with that. She knew that their families would be there either way and that was what mattered. 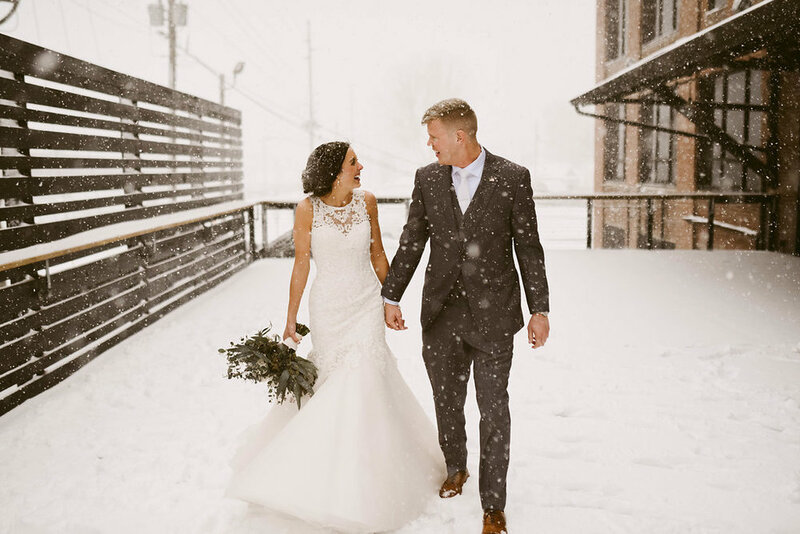 Additionally, many people were worried about her dress being ruined by the snow. She still took pictures outdoors. Overall, the day was simply magical. Although things did not turn out the way she had originally planned, Baylee could not be happier. “It was not what we expected, but I still got to marry my best friend,” said Baylee.